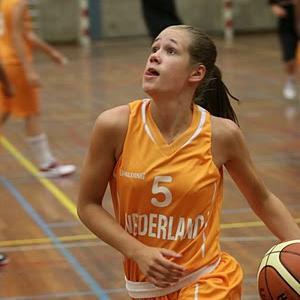 In the summer of 2009, the Netherlands international youth basketball programme reached new heights with promotion for three teams, which included the Netherlands U16 Women. Kourtney Treffers (left) and Klaziena Guijt (Guyt) are the only members on the U16 team that won the 2009 FIBA Europe U16 European Championship Women Division B that are eligible for this year. The Netherlands Basketball Federation have implemented a plan that consists of a 50-day preparation for the U16 and U18 teams and a number of youth international basketball games prior to the summer championships. The U16 programme was tough this year and started with some games at the Earlybird Easter tournament in Pumerend (Holland), which the team won. The next outing was a three-match series with Germany. The training roster was reduced after these games. At the end of July the Netherlands hosted an international youth basketball tournament in Sittard (Holland) with Denmark, France and Germany. The following report from this tournament was provided by Bas Hendrik. The French team actually arrived late for this tournament, thinking that the tournament was to tip off on Saturday and as a result the Dutch team opened the proceeding with a game against Denmark. The Netherlands had no problems beating Denmark (72-49) with 29 points coming from Kourtney Treffers. Isabella Slim and Britt Zappeij added 14 and 13 points each. On the final day the Netherlands were pushed all the way by Germany before coming away (58-54) with Treffers and Laura Cornelius (above) leading the scoring in double digits with 14 and 12 points each. Due to France's late arrival on the first day, they did not have time to stretch their legs after the journey and lost (65-60) to Germany. On the second day France played the Netherlands in what turned out to be the tournament decider. France were quick off the mark and led (11-1) with just four minutes played. The game became a little rough and the officials were having problems controlling the game. France led (23-17) at the end of the first quarter and stretched their advantage to a maximum of 11 points. However the Dutch players with some generous free throws and good work from Cornelius and Slim went into the interval trailing (32-36). Valeriane Ayayi from France was hurt early in the third quarter and had to leave the game. The Netherlands seized the moment and went in front for the first time and led (50-46) going into the final quarter. Then France picked up and stepped on the accelerator to win the match (64-59). France went to the free-throw line 22 times in the game, on the other hand the Netherlands went to the line 40 times. For France Mousdandy Djaldi-Tabdi, Marième Badiane and Awa Sissoko all finished in double digits with 14, 13 and 10 points each. France beat Denmark (64-43) on the final day which assured them the winner's trophy. The Netherlands finished the tournament in second place. Alongside Céline Pfister from France, Kourtney Treffers was also a member of the all-tournament team. Next stop for the Dutch players was a three-match series in the Czech Republic before heading out to Greece to complete their preparation with a two-match series against Greece. Inez van Hulsen, Laura Cornelius, Klaziena Guijt (in picture), Jacobine Klerx, Aggy Schalkwijk, Carmen Droste, Isabella Slim, Kourtney Treffers, Naomi Harris, Britt Zappeij, Marlou Peters. The Netherlands have won 2-from-3 games at the U16 European Championships so fare and are assured a place in the elite for 2011.